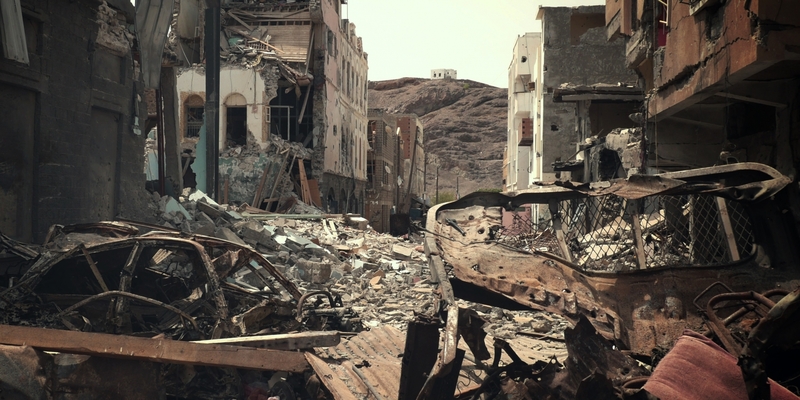 On 27/28th April 2015, a residential street in the Crater in the district of Aden, Yemen, was struck by Saudi led coalition airstrikes hitting homes, cars, a school, a mosque and a maternity clinic, killing 18 civilians and wounding 47 others, including women and children. 'Up to 18 civilians were killed and 47 others wounded when warplanes of the Saudi-led coalition forces mistakenly hit a populated neighborhood in Yemen's southern port city of Aden on Monday, a government official told Xinhua. "A number of missiles fired by the Saudi-led warplanes struck a residential neighborhood in the district of Crater of Aden city by mistake, leaving dozens of people killed and wounded and destroying several houses at the scene," the local government official based in Aden said on condition of anonymity. "According to the initial reports, the Saudi-led airstrike killed about 18 civilians and wounded 47 others, including children and women," the government source said. Local residents confirmed to Xinhua that "very huge explosions rocked the populated neighborhood and caused several buildings to collapse while many people were living there." An army commander fighting alongside with tribal militia loyal to Yemen's President Abd-Rabbu Mansour Hadi in Aden said that "apparently the Saudi-led airstrike were aiming to target armored trucks of the Houthi gunmen stationed in Crater district."